I bought this box of Revell Celts at a hobby shop when I was in university. It was the first set of toy soldiers that I had bought since I was a little kid. I did a not-so-great paint job and left them to languish in their box for a number of years. About a year ago I pulled them out again based them on 20mm squares for WAB, and re-painted. The original paint was enamel. Much had flaked off, the new coat of acrylic krackled in some areas, but now I think they're looking pretty good. The box was labeled with the generic term, Celts. From their shields it seems these are meant to represent the celts of Britain. I'm impressed the sculptor did his research. The energetic fellow in the top photo is carrying a blue shield which based on the "Chertsey Shield" found Surrey, England. In the lower photo the swordsman at the left carries a green shield based on the "Witham Shield." In the middle we see a distinctive shield boss modled after a find from Wales, now in the Cardiff Museum. On the right the figure holds a duplicate of the "Battersea Shield" found in the Thames. )See my article describing the major archaeological finds of Celtic shields.) The rest of the set features other historic shield boss finds, and a Celt-Iberian shield depicted on pottery. You know, I think I like this blog because it's half history lecture- half gushing about TOYS! Yay! This is a great set and it's a shame that it's hard to find these days. 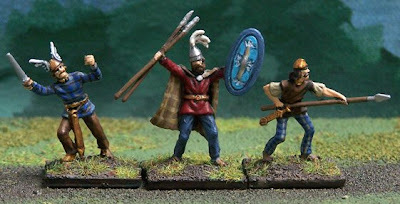 I managed to buy a couple of boxes on eBay last year and have them painted up in warbands, mixed up with Airfix figures, which are the same size. I wouldn't be surpsied if Revell re-releases this set. 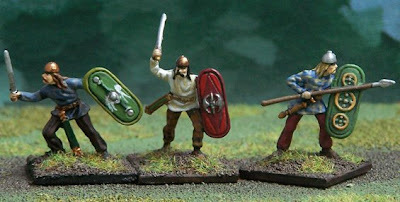 Wasn't it only last year that they put their Saxon and Norman sets back on the market? Those sets had been gone for almost 20 years!